Pulmonary Hypertension (PH) is the general term used for high blood pressure in the arteries of the lungs that can cause heart failure. But there are different forms of Pulmonary Hypertension. Some forms are secondary to other medical conditions. PH is considered a serious conditon and should not be confused with common hypertension (high blood pressure). Pulmonary Arterial Hypertension (PAH), Primary Pulmonary Hypertension (PPH), Idiopathic Pulmonary Arterial Hypertension (IPAH), Associated Pulmonary Hypertension (APAH), Familial Pulmonary Arterial Hypertension (FPAH), Heritable (HPAH) Pulmonary Arterial Hypertension, Chronic Thromboembolic Pulmonary Hypertension (CTEPH), Pulmonary Venous Hypertension (PVH), Portopulmonary Hypertension (POPH). Understanding normal blood flow through the heart and lungs. The blood drains back to the heart via the veins and then into the superior and inferior vena cavae. This blood is low in oxygen, as it has been used by muscles and organs around the body. The low oxygen blood enters the right atrium of the heart and then flows through the tricuspid valve to the right ventricle. The right ventricle pumps the blood through the pulmonary valve into the lungs via the pulmonary arteries. This is normally a very low-pressure circuit and the right ventricle is a weak muscle. Once the blood has obtained oxygen in the lungs it drains back to the heart via the pulmonary veins. 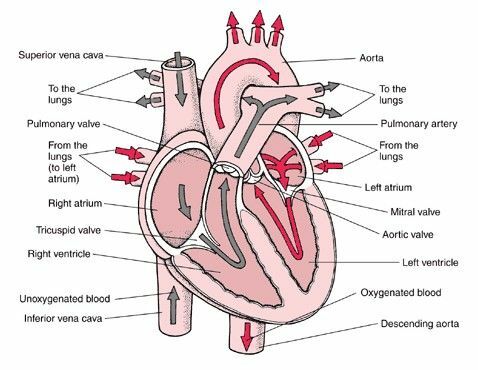 High oxygen blood passes from the left atrium of the heart through the mitral valve into the left ventricle. The left ventricle is a powerful muscle and pumps this high oxygen blood to the muscles and organs of the body through the aortic valve and into the aorta then the various arteries of the body. This is a much higher-pressure system. Pulmonary hypertension is defined as an abnormal increase in the blood pressure in the pulmonary arteries. As outlined above this is usually a very low-pressure system. With normal pressure around a mean of 14mmHg. Pulmonary hypertension is defined as a mean pressure of greater than 25mmHg at rest or greater than 30mmHg on exercise. These pressures are normally much lower than the systemic blood pressure from the left side of the heart (this is the blood pressure that is measured in your arm) and is normally around 120/80 with a mean of 75 to 80 mmHg. Pulmonary hypertension occurs when the blood vessels in the lungs receiving the low oxygen blood from the heart become narrowed. This is narrowing in the pulmonary arteries. Like a kink in the hose as the arteries narrow, the pressure required to keep the same amount of blood flowing needs to go up. Eventually, the heart is not able to keep up the same flow rate and symptoms of breathlessness, fatigues and dizziness result. To see full Classification document, click here. Pulmonary Arterial hypertension can occur alone or in association with other diseases.